The Attic24 SWEET PEA CAL will will run for 8 weeks in total, beginning on Friday 4th January - that’ll be the day when the pattern will be published here on my blog and I’ll give you all the information you need to get started. I’ll then give weekly updates every Friday throughout January and February 2019 so that we can make the most of weekend hooky time. There will be a full picture tutorial here on my blog for the new Trellis Stripe pattern. 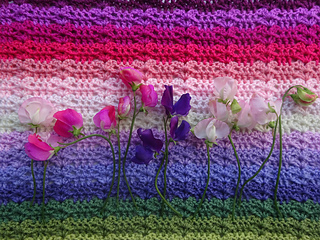 Each week I’ll share the colour stripe order for the two different versions of the Sweet Pea blanket I’m making. The SWEET PEA YARN PACK contains 15 x 100g balls of Stylecraft Special DK and is enough to make one blanket/throw. There is no printed pattern included in this pack, all pattern info will be here on my blog, with updates every Friday throughout January and February 2019. The Sweet Pea blanket will measure approx. 120cm x 175cm. You will need two packs if you wish to make a larger/double bed size blanket. I’ll give starting chain/pattern guidance for those of you wishing to make larger (or smaller) blankets. Yardage is based on 15 balls of Stylecraft Special DK for twin blanket - 30 balls for larger blanket.